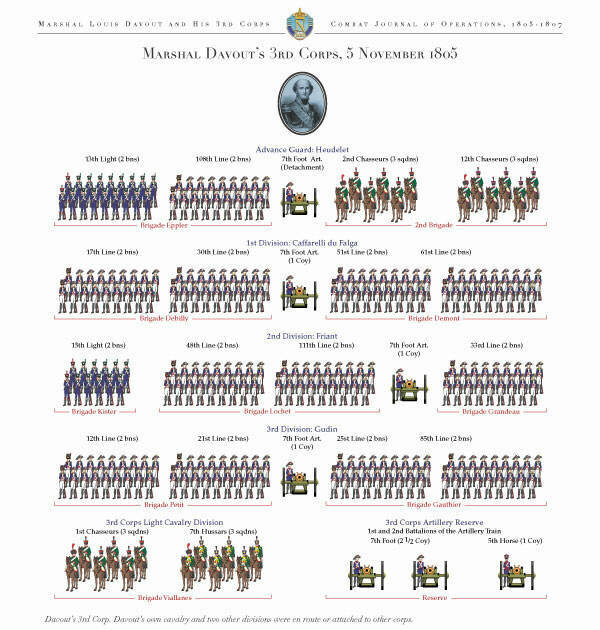 Napoleon's Finest: Marshal Louis Davout and His 3rd Corps, Combat Journal of Operations, 1805 - 1807 Berkeley: Military History Press; 2003. Translation and Commentary by Scott Bowden 256 pages; 20+ color maps; 5 Orders of Battle in full color; $150 plus shipping after it's published in late November 2003; $112.50 with shipping included until the end of July 2003. Hardcover. Napoleon's greatest triumph was Austerlitz - the campaign as well as the battle. But the finest proof of the quality of the Grande Armée came in the following year when Davout's Third Corps took on and defeated the larger half of the Prussian army at Auerstädt while Napoleon was miles away at Jena. Auerstädt displayed the qualities of the French army at its finest: high morale and an inner confidence of victory; esprit de corps and discipline; and superb leadership at every level from subaltern to marshal, which gave it extraordinary tactical flexibility. Even so, it may be that no other corps in the Grande Armée could have survived the Prussian onslaught and gone on to take the offensive, but Davout's strict discipline, attention to detail and intensive training had transformed the ordinary line regiments of his corps into a true elite, while his coolness in action was vital as he anticipated threats before they arose and rallied the spirits of his weary troops whenever they began to flag. The battle of Auerstädt came early in the campaign, barely a week after the war had begun, and the Third Corps was in perfect condition. 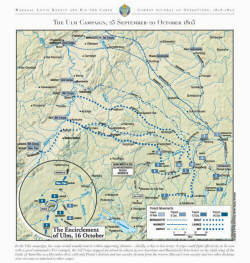 It was followed by hard marching rather than hard fighting as the French swept almost unopposed across Prussia. Davout and his men were given the honour of making a ceremonial entry into Berlin on 25 October; a week later they were on the Oder, and captured the great fortress of Küstrin through a mixture of threats and bluff. 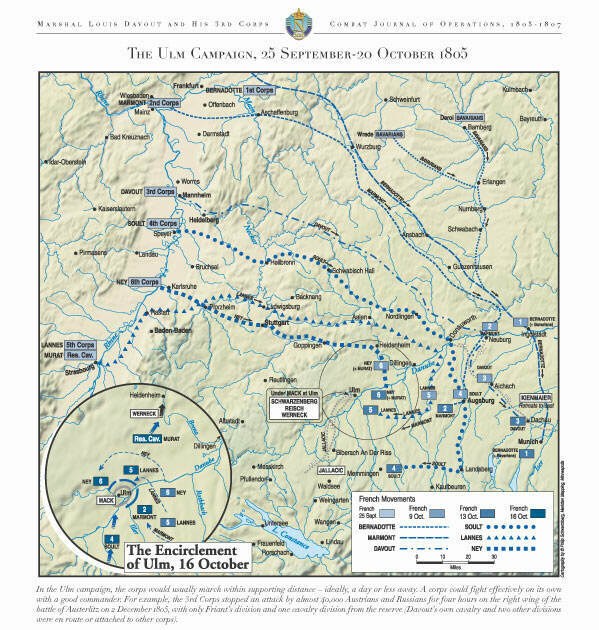 A second campaign followed in Poland in the winter, spring and early summer of 1807 against the Russians as well as the remnants of the once great Prussian army. The Third Corps played a less prominent but still important role in these operations, and the combination of weariness and Polish mud impaired its efficiency a little. Nonetheless, its crossing of the River Bug and role in subsequent operations up to and including the terrible battle of Eylau are full of interest. After the war was over, in the relative peace of the second half of 1807 and 1808, Davout and his staff prepared an official report on the operations of the Third Corps which was presented to Napoleon on 9 January 1809. This document was published in France more than one hundred years ago in 1896. It has been used by historians writing about the campaign in English - Petre, Maude and Chandler - and by John G. Gallaher in his biography of Davout, but they do not have space to do more than hint at its richness. More revealing is Col. H. C. B. Rogers who devotes the two most interesting chapters of his book Napoleon's Army to a summary and discussion of the Third Corps at Auerstädt and in Poland. The result is fascinating but frustrating, for one can never be sure which parts come from Davout's report, and which are Rogers's own surmises. Now at last we have a full translation of the whole report, including the invaluable appendices which print not only the correspondence between Davout and the Imperial Headquarters, but also the letters and orders of officers within the corps. This provides a unique insight into how the Grande Armée functioned on campaign: it does for the body what Vachée's Napoleon at Work does for the head, making it essential reading for anyone interested in the mechanics of Napoleonic warfare. There are also some unpleasantly sychophantic paragraphs describing the reaction of the troops to a review or proclamation by the Emperor which rather diminish one's respect for Davout, although they shed interesting light on the hero worship which surrounded Napoleon. As with any primary source, the evidence presented is partial in both senses of the word, and the calculations of Prussian strength and losses are probably inflated. But the value of the report lies on the near side of the hill, on the evidence, which it collects, so soon after the event, of how the Third Corps overcame such heavy odds in battle, and of the mundane but important details of its marches and bivouacks. So much of the military history of the period (and of most other periods) has been written exclusively from the viewpoint either of the eagle or the worm that it is a revelation of to find such a rich source of material relating to the intermediate levels of command. To give just one example where there are dozens: the appendices print a report from Chef de Bataillon Villeneuve who commanded the artillery of the 2nd Division written soon after Auerstädt. From this we learn that Friant's division had five 8-pounders, one howitzer and two 4-pounders present, and that during the fighting they were divided into three batteries: two of the 8-pounders, served by the artillerie-á-cheval; the two 4-pounders served by the artillerie-á-pied; and the remaining guns, also presumably served by the artillerie-á-pied. Few of these details conform to our expectations - the mixture of the calibres, the allocation of the heavier guns to the horse artillery, and the division of such a small force into three sub-units are all rather surprising. This is what makes the report so valuable: it provides evidence against which we can test our confident assumptions and sweeping generalizations, and reveal the gap which often existed between official regulations and actual practices in the field. Villeneuve does not attempt to describe each move made by the three batteries during the fighting - he probably never knew the names of half the villages he passed by - but he gives details of the losses suffered by the gunners in the battle. As usual in the artillery they were light: nine men were wounded, an officer had his horse killed under him, and more than twenty other horses were killed and others injured, seventeen muskets and eight haversacks were lost. Even in isolation this is interesting and useful, but here we have it in context, surrounded by other reports from officers at all levels which when studied closely form an intricate tapestry full of insights into what actually happened on the battlefield. Interest in the Napoleonic Wars has grown remarkably in the last fifteen or twenty years: many old books have been reprinted and much good new work has been published. This translation represents a real step forward in making one of the most rewarding but inaccessible sources available to a new public. The publishers promise that it will be produced in a handsome, deluxe edition, complete with excellent maps and illustrations, and priced accordingly - which is probably a necessary and realistic decision, for the market for such an advanced work, without immediate connection to Napoleon, Wellington or Waterloo, is necessarily limited. Serious scholars and real connoisseurs will welcome it with enthusiasm and look forward to more such gems. 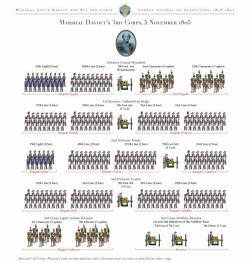 Biographies of the commanders down to Colonels.